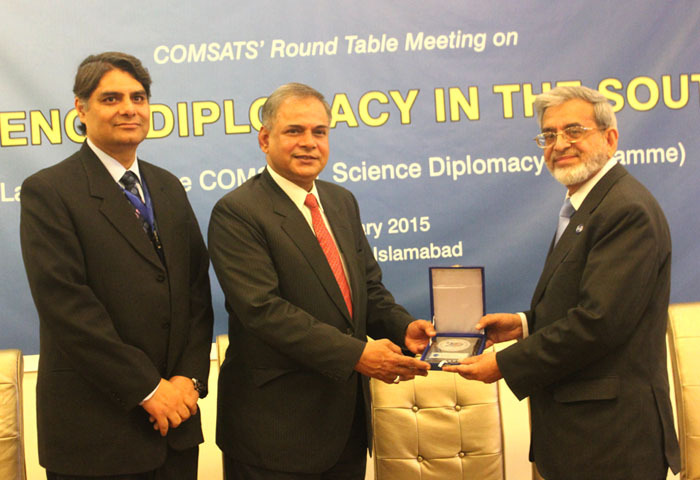 COMSATS launched its “Science Diplomacy” program on February 25, 2015, during a Roundtable Meeting held in Islamabad. 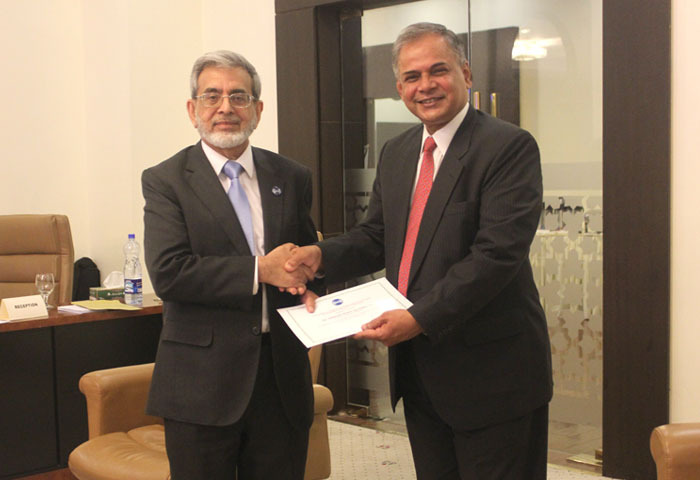 Following the decision made by COMSATS Coordinating Council in its 17th meeting held in May 2014, the new initiative would be geared towards improving international relations among developing countries and supporting their efforts to achieve foreign policy objectives through cooperation in S&T. The meeting was chaired by Mr. Amjad Hussain B. Sial, Special Secretary (Policy Planning), Ministry of Foreign Affairs, Government of Pakistan. In his address on the occasion, Mr. Sial considered it imperative for developing nations to remain abreast with latest scientific advances for objective and informed decision-making in the face of emerging national and trans-boundary challenges, like those pertaining to environment, health and food security. Expressing the government’s awareness of the need for using scientific interactions as a means of strengthening international relations, he stated that the gover nment is “indebted to COMSATS for a timely initiative to focus on such a key area of national interest”. 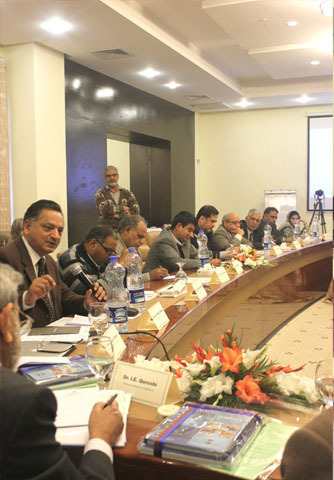 The programme, among other things, entails activities for science advocacy and popularization, formation of a think tank, establishment of COMSATS Diplomacy Centre, organization of seminars and round table discussions for key stakeholders, as well as series of talks on scientific aspects of issues such as biodiversity, water conversation, energy, climate change, and disarmament, etc. On the occasion, five science experts were designated as “COMSATS Science Ambassadors” in various fields that included: Dr. Arshad S. Bhatti (Physics); Dr. Athar Hussain (Climate Change); Dr. Raheel Qamar (Biotechnology); and Dr. Nasrullah Khan (Energy), from COMSATS Institute of Information Technology (CIIT), as well as Dr. M. Sabieh Anwar (Engineering and Technology) from Lahore University of Management Sciences (LUMS). Moreover, Dr. I.E. 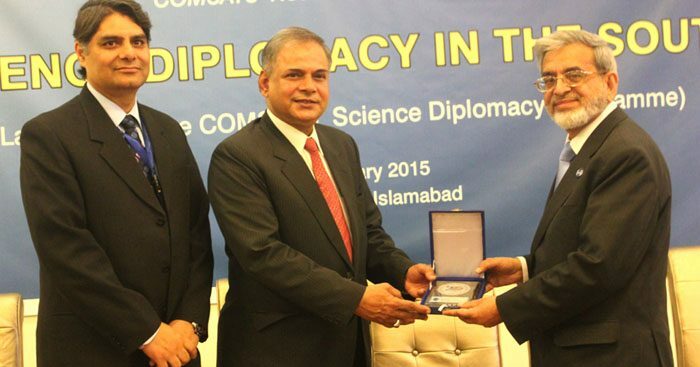 Qureshi was unanimously conferred the title of ‘Science Ambassador Emeritus’ in the field of Science Diplomacy. Speaking on the occasion, Dr. Qureshi touched upon various facets of science diplomacy and informed that operationally COMSATS has been engaged with all these activities since its establishment in 1994. 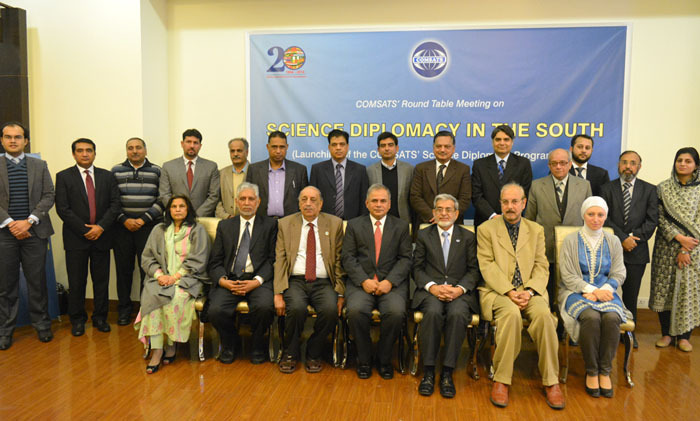 Emphasizing the need for an adaptive model of Science Diplomacy that suits the interests of developing countries, he stated that COMSATS is well-placed to play a central role for Science Diplomacy. He attributed this distinctive position to a large pool of scientific human resources available in COMSATS’ 19 Centres of Excellence; its expertise for organizing workshops and training programmes for S&T capacity building; and the coordinating role the organization is playing for joint international research projects that address common issues in developing countries under the programme of ‘International Thematic Research Groups’. “Policy makers in developing countries have to be sensitized about the importance of S&T capacity-building as a fulcrum of development strategy”, asserted Dr. Qureshi. While defining the contours of science diplomacy, he said that developing countries will have to tailor all sectors of science diplomacy and create relevant expertise to safeguard their national interests. As a first step, the programme would take up Science Communication for the benefit of decision makers in Pakistan and would be expanded to conduct similar activities in other member countries, noted Dr. Qureshi. It was informed that a six-month activity of the programme has already been chalked out, which would be coordinated by Dr. Arshad Saleem Bhatti, Dean Faculty of Sciences, COMSATS Institute of Information Technology (CIIT). Dr. Arshad Saleem Bhatti, in his remarks, cited the examples of international collaborative research projects, where scientists belonging to different nations have been working together despite the political differences between their countries. Answering to some questions from the participants, Dr. McGrath considered it important, especially in the context of the developing countries, to first identify common important issues of a region, which need inter-state coordination. As a strategic step in building a sound scientific diplomatic culture among the regions where it is hard to implement scientific diplomatic relations owing to lack of cooperation or capacity, he opined that as a starting point relatively lower level exchanges of young scientists could help create the desired networking. Over time, these scientists could move to senior level positions and partake in diplomatic and policy level decision making. He also commented on the restrictions on scientists from developing nations who aspire to specialize in emerging fields but are denied the opportunity in disciplines deemed to be of dual use. He opined that continued efforts through science diplomacy are needed to bring about the desired change of mindsets. Appreciating the role of COMSATS in S&T-led development in the South for over 20 years, he considered the organization an important international player in the field of science diplomacy. 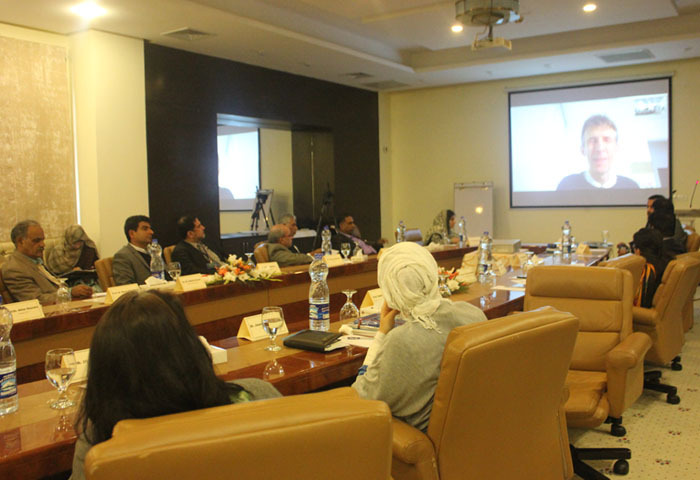 Suggestions, ideas, and concerns were shared by the designated Science Ambassadors and participants during a general discussion session chaired by Dr. Anwar Nasim, President of Pakistan Academy of Sciences (PAS). Ways were discussed to make the COMSATS Science Diplomacy programme effective and how it can be tailored to addressing the needs of the developing counties. Among the distinguished participants of this discussion were: Prof. Dr. Zabta Khan Shinwari, Secretary General, Pakistan Academy of Sciences; Mr. Amjad Hussain, Joint Scientific Adviser (IL), Ministry of Science and Technology; Ambassador Fauzia Nasreen, Advisor/Head, Centre for Policy Studies, CIIT; Ms. Sadia Malik, Assistant Director (IC), Pakistan’s Ministry of Foreign Affairs, and senior officials and academics from COMSATS Secretariat and CIIT. The participants discussed matters ranging from popularization of science, quality of science education at the grass root level, to resolving the regional disputes with neighboring countries through effective diplomatic means backed by sound scientific expertise. Media, it was agreed, can help for popularizing science, and serve as effective means for science advocacy. In the context of Pakistan-India relations, the need for an equitable scientific solution to address the issue of water stress was emphasized as part of efforts to normalize the relations between the two neighboring countries. In his concluding remarks, Dr. Qureshi expressed satisfaction on the outcomes of the meeting and summed up the key deliberations made during the Round Table Discussions. He explained how scientific community can play its due role in building a prosperous society, through science popularization, advocacy and diplomacy. He thanked the Ministry of Science and Technology, and Ministry of Foreign Affairs, Government of Pakistan; PAS and some universities in Pakistan for pledging support for this timely initiative of COMSATS. The meeting concluded on an optimistic note that COMSATS is determined to take on the arduous task of bringing science to the hearts and minds of the policy makers and the people, at large.